The interactive walkabout combines topology, history, image search and route map. A guide leads the walk. 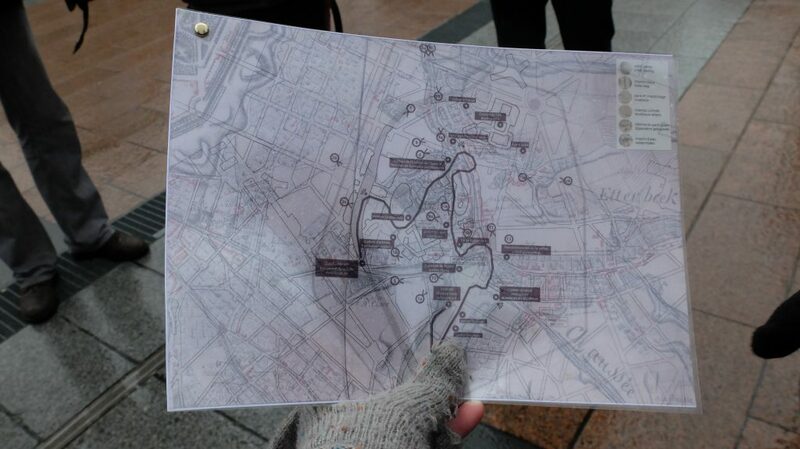 Each walker receives small cards and a map that superimposes different levels: the current city, the state of the building, a relief map, cultural and historical elements etc. Each layer of the map allows a certain level of understanding of the city. Participants are encouraged to take pictures of places that they find interesting for the neighbourhood and to choose boxes to describe these spaces. The interactive walk aims to describe a place from different perspectives, in order to generate a better understanding of the city and stimulate the creation of new ideas for a neighbourhood.